Touch-based clicking is an alternate input form that uses trackpad (or Magic Mouse) taps as a click. 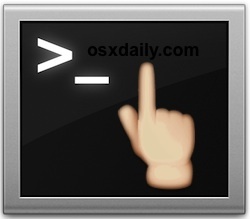 For most Mac users, turning on tap-to-click is best done from Mac OS X System Preferences, but advanced users who require more control, automation, or remote enabling of the feature can also enable tap-to-click through the command line by using defaults strings. Using this advanced method also offers the benefit of allowing touch-clicking at the login screens of Mac OS X, something that isn’t available by default if enabled through the GUI controls. Using touch-to-click or tap-to-click requires a multitouch compatible Mac trackpad or mouse, whether that’s a newer model MacBook Pro or Air, or a Magic Trackpad or Magic Mouse. If you’re not comfortable with the command line and Terminal, you’re better off using this approach instead. You’ll notice there are three separate and unique defaults strings listed, one of which enables the general tap click behavior, while the next enables the feature for the Magic Mouse, and the other provides support for tap-to-click at the login and boot screens of Mac OS X. To be thorough and get full touch-click support throughout Mac OS, issue all commands separately in the Terminal, then reboot the Mac. As usual, each command should be placed on a single line when executed at the terminal. These defaults strings have been tested to work in many versions of MacOS system software, including macOS Mojave, macOS High Sierra, MacOS Sierra, OS X El Capitan, OS X Yosemite, Mac OS X Mavericks, and others. If you have other experiences or commands related with these defaults strings for enabling tap-to-click then share them in the comments below. Again, reboot the Mac for all changes to take effect when using this command line approach. Optionally you can also disable tap-to-click by going to System Preferences on the Mac and adjusting the tap-to-click Mac trackpad settings. Do you know of another method for enabling and disabling tap-to-click from the command line of the Mac? Share them in the comments below! This does not work on OS X 10.9.3 Mavericks. Yes it does work on OS X 10.9.3 Mavericks, I am using it right now for enabling tap-to-click. You are probably entering the command wrong, be sure it’s on a single line and typed properly. You can use ‘defaults read’ to verify the command has been entered properly. I’m on 10.9.4, and don’t seem to be able to get this work either. All the defaults return 1 when I read them, so they are written correctly. But tap to click still only works for logged in users who have set it manually, not by default, and not in login screen. Nope, this does not work on Mavericks 10.9.5 either. However, after reboot, there still is no tap behavior beyond what the options in System Preferences cover. In Version 10.9.4 this does nothing to enable tap to click in the magic mouse.